This entry was posted on Tuesday, December 16th, 2008 at 4:47 pm and is filed under Uncategorized. You can follow any responses to this entry through the RSS 2.0 feed. You can leave a response, or trackback from your own site. You may not be aware that you have to be an IT genius to leave a comment on your blog (fortunately I’m married to one). 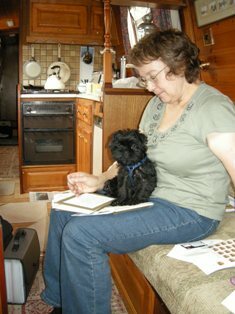 Everyone in the boating blogging doggy community has been desperately sad for your losses but unable to contact you or your blog – we hope you have read the expressions of sorrow for you on individual blogs which have been the only means of reaching you. Take care & please don’t let the gorgeous Steady Eddie break your hearts all over again when he moves on to his new life.